Most people have probably been in a situation where they doubted whether they could achieve something they wanted to do. But we all know one is only going to know if that is true or not by trying. This is the message that I wanted Cleo and Pogo to convey in my story. 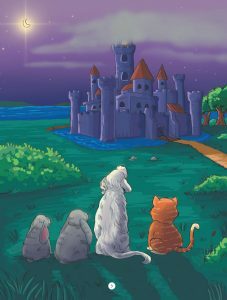 Pogo doubted himself inside the castle but when Cleo encouraged Pogo to only try, the curly haired dog found out that he was capable after all. But the other side to this story is that it was first Pogo who encouraged Cleo to think of a solution to the dilemma they were facing while looking outside the castle window. Well, Cleo did manage to come up with an idea, but it involved Pogo getting right into the thick of things. Pogo, not expecting the circumstances to fall back on him, at first felt incapable. But as the story goes, Pogo gained the necessary confidence to help solve the problem in the story. However, would Pogo have pulled through without Cleo’s encouragement? Perhaps Pogo would not have had the courage to do what he needed to do. Cleo shows how it is so important to be individuals who encourage others to accomplish what is very necessary to make our world a more beautiful place. And I believe that people who motivate others will in turn be given that same encouragement. Yes, Pogo the Dog thought it was a daring feat to venture inside the castle, but, as usual, he follows Cleo the Cat who is always up to an adventure. I think Cleo likes castles, and it seems all of her friends do as well. Have you ever been inside a castle? I would think the experience would be very interesting. Join Cleo in the Castle as she takes you on an adventure inside the castle.